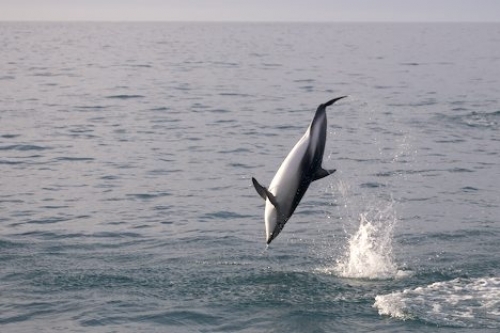 Jumping Dusky Dolphin off the Kaikoura coast on the South island of new Zealand. Kaikoura is one of the best locations to go on a dolphin watching tour. Especially in the summer month Dusky Dolphins stay close to shore, which makes it easier to watch them. We highly recommend a Dolphin watching tour beside the "usual" whale watching tour while in Kaikoura. Picture iof a jumping Dusky Dolphin, also known as Lagenorhynchus obscurus, Kaikoura coast, South Island, New Zealand.